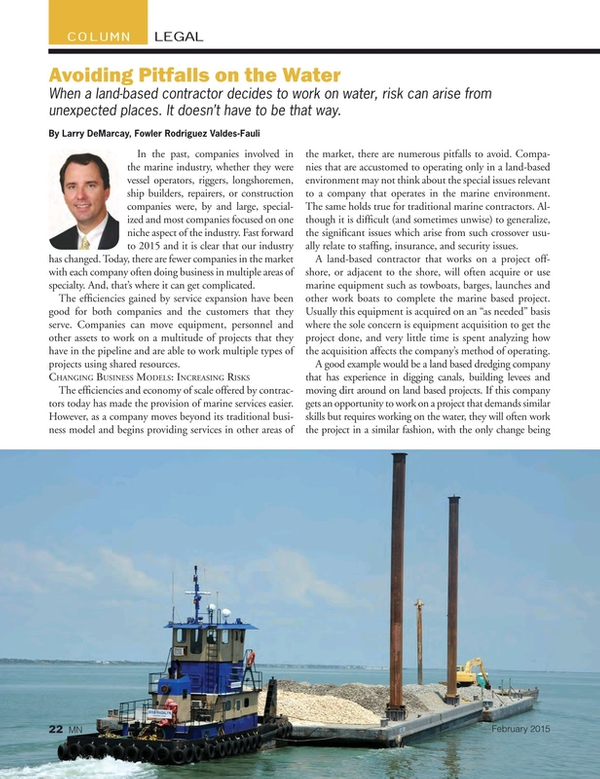 When a land-based contractor decides to work on water, risk can arise from unexpected places. It doesn’t have to be that way. In the past, companies involved in the marine industry, whether they were vessel operators, riggers, longshoremen, ship builders, repairers, or construction companies were, by and large, specialized and most companies focused on one niche aspect of the industry. Fast forward to 2015 and it is clear that our industry has changed. Today, there are fewer companies in the market with each company often doing business in multiple areas of specialty. And, that’s where it can get complicated. The efficiencies gained by service expansion have been good for both companies and the customers that they serve. Companies can move equipment, personnel and other assets to work on a multitude of projects that they have in the pipeline and are able to work multiple types of projects using shared resources. The efficiencies and economy of scale offered by contractors today has made the provision of marine services easier. However, as a company moves beyond its traditional business model and begins providing services in other areas of the market, there are numerous pitfalls to avoid. Companies that are accustomed to operating only in a land-based environment may not think about the special issues relevant to a company that operates in the marine environment. The same holds true for traditional marine contractors. Although it is difficult (and sometimes unwise) to generalize, the significant issues which arise from such crossover usually relate to staffing, insurance, and security issues. A land-based contractor that works on a project offshore, or adjacent to the shore, will often acquire or use marine equipment such as towboats, barges, launches and other work boats to complete the marine based project. Usually this equipment is acquired on an “as needed” basis where the sole concern is equipment acquisition to get the project done, and very little time is spent analyzing how the acquisition affects the company’s method of operating. A good example would be a land based dredging company that has experience in digging canals, building levees and moving dirt around on land based projects. If this company gets an opportunity to work on a project that demands similar skills but requires working on the water, they will often work the project in a similar fashion, with the only change being the equipment that is needed, such as the towboats or barges that they acquire to operate their equipment over water. With regard to staffing, operating vessels with unqualified and/or inadequately certificated crew can expose the company to liability or invalidate certain insurance coverage. The courts have ruled that a vessel that is not manned by a competent master and crew is unseaworthy. Furthermore, the insurer may exclude coverage by showing incompetency of the crew. Thus, if you operate a vessel without properly vetted and licensed crew, and an accident occurs, you could be found liable and the insurance company may decline paying for any of the damage if you do not have the right crew on board. A comprehensive discussion of manning requirements could fill a library and otherwise is beyond the scope of this article. By way of illustration, 46 U.S.C. §8904 states that a towing vessel of at least twenty-six feet in length must be operated by an individual licensed by the Coast Guard to operate that type of vessel in that particular geographic area. As such, each towing vessel must be operated by a captain that is licensed with the appropriate level license. The statute also includes a provision that regulates the “hours of service” that the employee can work. These hours of service rules may or may not match up with the traditional work schedules of land-based work crews. Depending upon the scope of the work being performed, and the workboats utilized, it is important to analyze your operation to make sure that you have acquired the right employees to operate the equipment that you are utilizing. Your land based equipment operator may have the ability to run the small push boat that you acquired to move the barge around, but should he? Only a thorough examination of the rules specific to your situation can identify these potential issues. With regard to insurance, a land-based operator will be familiar with the workers’ compensation system and will have obtained adequate insurance to protect employees and the company from the types of risks they would typically expect on shore. However, once these land-based operators move to the marine environment, insurance needs differ and these traditional insurance policies may not (and probably will not) cover many of the risks inherent to operating in the marine environment. With regard to employees, it is important to note that a workers’ compensation policy will not afford coverage to employees that are found to be Jones Act Seamen or longshoremen under the Longshore Act. With regard to property insurance, adding a recently acquired boat to the company’s schedule of equipment on an existing property policy may not provide the coverage that you need in the event that someone is hurt aboard the vessel or if the vessel is involved in an accident that causes damage to someone else. As contractors venture out beyond the scope of their usual method of doing business, it is important to sit down with an insurance broker to discuss the operational changes, identify potential risks and to procure insurance policies that adequately protect the company from these risks. Lastly, and sometimes depending upon the location of a project, certain marine projects require security measures that are not present in most land based jobs. For example, when working on a project at a marine facility that regulated by Maritime Transportation Security Act (MTSA), you may have to have your employees obtain a Transportation Worker Identification Credential (TWIC Card) from the Transportation Safety Administration. And, while that process has, over time, become a little less onerous, obtaining those cards can take time. It is also possible that, depending on the criminal records of certain employees, the issuance of the card may be denied. A TWIC card is required for any employee that needs unescorted access to a covered facility and your employees may not be allowed on-site until they are properly certified. A little advance planning will help you avoid an embarrassing project shutdown or delay caused by having a workforce that has not been approved by the TSA. A growing list of infrastructure projects along the nation’s waterways is opening up new opportunities for many firms. Moreover, the June 2014 passage of the Water Resources Reform & Development Act (WRRDA) will infuse much needed funds into this sector. That said; and while the expansion into new service areas provides an excellent opportunity for contractors to grow the business, at the same it also exposes the company to new risks that may not have been present in the past. None of these potential risks should keep you from growing your business as these issues can be easily mitigated by working through your specific situation to determine how these changes affect your current risk profile. Once the potential risks are assessed, you can determine how your operation can be modified to manage these issues. As such, a little time spent meeting with your attorneys and insurance professionals on the front end can protect your company from any surprises in the future.